Let’s talk about how it can be one of the most important factors in your nutrition goals and health. Having a plan allows you to see what you need in bulk and how to spread ingredients across meals so there’s less food waste (and money waste). Also, it cuts down the times you need to run to the grocery store – and buying extra things that rack up the grocery bill. Sure, there’s some time investment forefront, but it allows you to have time freedom later in the week. And saved time is useful for getting other things done that you need to focus on. That extra time can also be spend sitting down and having a meal with family and building priceless memories. Having your food planned helps keep you on track to your nutrition-related goals by giving you a “fast food” option right at home. It’s hard to eat healthy if you don’t have the resources available to take advantage of. Meal prepping allows you to eat what you need so you aren’t falling back on getting that bag of chips or candy bar (or any highly processed, high calorie foods, hyper-palatable foods that make it easy to over consume). Ever wonder what to make for dinner or lunch the next day? Meal planning allows you to do the work beforehand, leaving that stress behind. Having your meals portioned out can be helpful if you struggle with eating too fast and missing fullness cues. Of course, you can always get more food if you’re still hungry, but having meals prepped gives your body a chance to relearn fullness cues. It’s hard to have consistent behaviors if your environment isn’t working with you. In coaching, I help people to be consistent regardless of environment, however in the beginning, when you’re trying to make healthy choices, it can be really helpful to have an environment that is supporting you. Meal prepping is one of those environmental factors that plays a big role in building consistent and healthy practices. The less time we spend on worrying about our food, the more time we can spend thinking of other important things. Having food prepped allows you to spend valuable mental bandwidth on other factors that can help you reach your life goals. I briefly mentioned this above, but when you are able to plan, you can see where you can overlap ingredients. The EPA reported that Americans disposed of 37.6 billion tons of food waste in 2015. While a big portion of that is coming from restaurants, we cannot deny that a portion comes from everyday homes. Reducing food waste also lowers your carbon footprint and conserves energy and resources required to take that waste. 10. Meal planning doesn’t just benefit adults. It plays a big role in helping kids get healthier too. Meal planning allows opportunities for repeated exposures to foods and promotes more adventurous eaters. It can also provide an opportunity for kids to learn to trust their body for hunger and fullness cues (or course, any eating opportunity does, but teaching their body to have somewhat of a schedule and trust of when the next meal/snack is coming is important for healthy hunger and fullness cues). Likely improved diet quality of kiddos is also a benefit. We often don’t have high diet quality when grabbing last minute items. 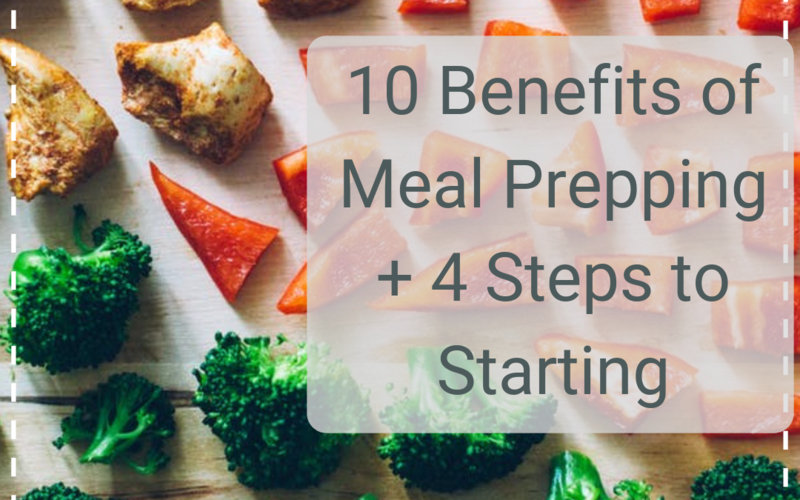 Putting some preparation in beforehand usually allows a balanced, healthier approach. The time saved in meal prepping allows more time to eating together as a family or with others. And with that, there are emotional and psychological benefits (of both kids and adults) of eating together. You might be sold on the idea of meal prep, but doing it in another thing. Make a plan of what you want to eat before (use my Food With Staying Power Guide for ideas). Make a list of everything you need and ways you can double up on recipe ingredients or meal components. Making roast? Buy a little extra or plan to use leftovers in a freezable breakfast taco. I like to spend as little time meal prepping as possible. You don’t have to spend hours in the kitchen. The simpler you make it (less variety), the easier and less time-consuming it is. Whether it’s making lunch from dinner the previous night, or having 1-2 variations of lunch or dinner for the week, remember simplicity is key. There are going to be unexpected things that come up. Have some food back-ups on hand to save you. There are some really great frozen meal options these days, (evol is one of my fav brands), but you can also have frozen quinoa, frozen rice, microwavable rice packets, tuna packets, nuts, seeds, pantry-stored almond milk, peanut butter, canned green beans, and more.